The color of diamonds is graded by the complete lack of color(D) to yellow(Z). A chemically pure and structurally perfect diamond has no color like a drop of clear water. Diamonds are compared to a master stone set under controlled lighting for color grading. Our curated ethical diamond collection ranges from H to D.
The GIA Clarity Scale ranges from Flawless to I3. Natural diamonds are formed in the earth, during this process natural inclusions and surface blemishes can occur in the gems formation. 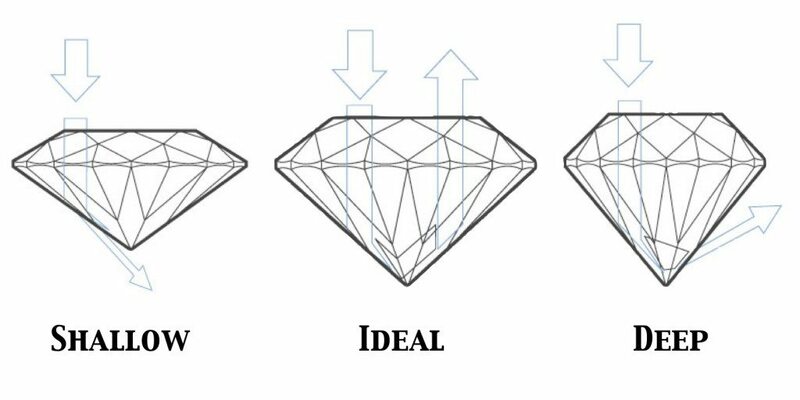 Evaluating diamond clarity involves determining the number, size, relief, nature, and position of these characteristics, as well as how they affect the overall appearance and brilliance of the stone. We're here to help contact us if you need help with a center stone. Diamonds are tiny, complex prisms prized for their sparkle and ability to refract light. The light enters through the top of the faceted gem, and is bounced around inside the diamond before being aimed back towards the top and out through the surface. The Cut does not refer to the shape but how well the diamond is cut overall and the facets interact with light. A diamonds cut is also affected by proportions, symmetry and polish, which are also noted on the grading report. One carat equals 200 milligrams. The carat is the measurement of how much a diamond weighs. A metric ‘carat’ is 200 milligrams. Carats are often subdivided into 100 points, using the hundredths decimal place for precise measuring. One quarter of a carat or .25 carats can be described as ‘25 points’, where as a 1.10 carat diamond would be described as ‘one point one oh carats.’ The higher the carat weight, the more rare the gemstone, the higher the price. No two diamonds are exactly alike, so two diamonds with the same carat weight can have very different values as determined by the other 3 C’s; Color, Cut and Clarity. Learn more about the 4 C's and how it affects the diamond price, or start your search for an ethical diamond here.